Never been slept on, generator and head have barely been used. New engine room heater has been added. Engines are twin 4.3 liter Merc's, and have been fully maintained by Marine Max/Searay. There are no rips, tears, stains etc., on this boat. It has a Beautiful Blue Hull, full bimini top, with full enclosure. 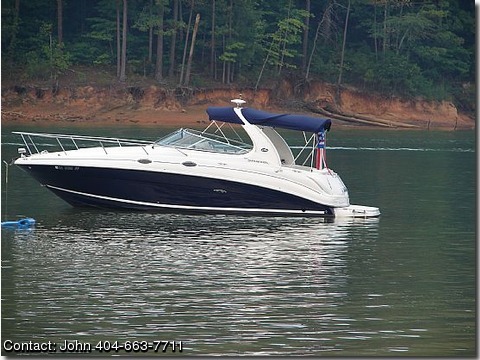 Comes with Searay Smartcraft Diagnostics, Smartcraft Digital Throttle and Trim System. TV, DVD, DISC Changer, Cherry Wood Cabinets and trim, Corean Counters, and much much more. Must see to appreciate how clean this boat is. Best of all, the boat has only 72 hours logged.